Oh my…I can smell it from miles away! How I do miss the food in New Orleans. My mouth is watering, can’t wait to try it out. Quick question what can I use instead of butter? Thanks so much. I had to fly out of NOLA on Monday, and this recipe made me less homesick on Mardi Gras (I’m not even from there, but I’m trying to find a way to be). Delicious! Made this for Father’s Day Dinner and it was not difficult to make. Thanks for a recipe we will enjoy over and over again. Thanks for a great recipe. I know it isn’t exactly Ã©toufÃ©e weather here in Dallas in July, but I was so excited, I made it anyway. I took it a little easy with the creole seasoning and hot sauce so as not to hurt the kids, but I had plenty of hot sauce waiting at my place at the table. My wife and I loved it. I will never throw shrimp shells away again until I have gotten a great stock out of them. Thanks again. Pretty good. I must warn anyone cooking this to check to make sure that you have enough time to make it. It took me nearly an hour and a half. I was rushing things because dinner was late and it was clearly not as good as it could have been. Dont undercook the shrimp. Make sure you simmer the stock for long enough. On my second try, VERY GOOD. Spicy and filling. However once you put the roux on to cook, it will take constant work. CHOP EVERYTHING IN ADVANCE or you stand a good chance at burning the roux. What a great receipe. I too will never again throw away shrimp shells without making a stock first. Only thing I wasn”t sure how many serving this made, I had to make extra stock but it still turn out great! Can’t wait to it make again! Wow! I made this dish, but modified it by mixing crawfish with the shrimp. Mmmmmmm…..so delicious!!! Thanks a bunch! Thank you NOLA for an EXCELLENT recipe! The best affirmation of a dish well prepared were the compliments from those who hailed from New Orleans and said that is was like tasting a bit of home. Not too bad for a girl from San Antonio! I look forward to experiencing many more recipes from your site. Be blessed! 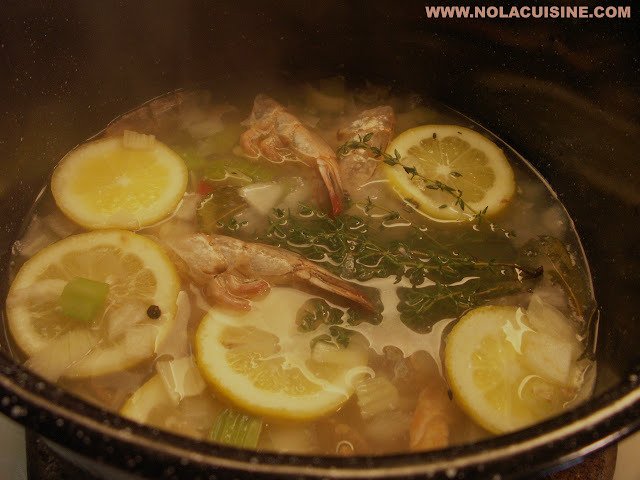 Is it important to keep the shrimp in its shell when cooking the stock recipe? I want to eat the etoufee without the shells. Is it okay to remove the shells and devain before I begin the stock recipe? mmmm yummy!!!!! I think I may try this for Christmas. I’ve become a big fan of your website. I learned to love NOLA food during the Katrina response and now i cant get enough. my friends tell me that the Shrimp Etouffee recipe may be the best food they ever ate!!! Dangit! You are making me soooo hungry!! lol That pic looks really good. I love the smell of it too. It’s almost as good as eating it huh? The black pepper makes the dish to me. But I do love a little extra pepper in my etouffee. Looks great!!! How many does this recipe serves? Fantastic recipe!!! This is hands-down, the best etouffee recipe I have ever tried — it is excellent. I highly recommend it. I have now tried two recipies from your site. Gumbo and the shrimp etoufee. I have been searching for recipies for both for years..I can now stop looking!! Fantastic. GREAT recipe. Well worth the time to make. Thanks for sharing it! Great recipe. Mine came out good even though I didn’t use a shrimp root. After sampling etouffee in the French Quarter, I came back to Buffalo, NY and made this recipe. It came out great!, but as Marcus said, have everything ready in advance. As for how many servings, I used just a little more of each vegetable ingredient, and served 6 large appetizer portions with leftovers! I love this recipe and I loved Renaissance NOLA. You rock, Danno! Our family goes back to the 1700s in the Crescent City. This is nearly my exact recipe – but I never thought to add anything besides shells to the shrimp stock. What a marvelous innovation! Thanks for sharing your authentic talent. Note- careful not to oversalt! excellent. easy. tasty. native new orleanian and this is really good. cannot wait to try the earlier suggestion using crab meat. Pingback: Restaurant Review: Gumbo’s Louisiana Style CafÃ© — It Doesn’t Get Any Hotter Than This! Wow. Fantastic recipe. My husband and mother in law loved it! I followed it exactly and it came out perfect. That stock rocks! It gave the sauce such a deep, rich flavor with just the right hint of lemon. I can’t wait to try it on company. I served it with brown basmati rice cooked with bay leaf. Tried this recipe. A total knockout! The secret without a doubt is the stock–and the butter–make sure you make the stock (you’ll need double what the recipe says if you’re a flavour (excuse my canadian spelling) cooker like me. I consider myself the king of rice pilaf–which requires total absorption of the liquid–FOLLOW THE RICE CREOLE RECIPE and you’ll be blown away. We’re having a New Orleans themed party and I can’t wait for the raves. It was delicious … HOWEVER … too spicy for my taste … I added twice as much stock as recommended so I could eat it … or perhaps my “spicy sauce” was too hot in combination with the Creole spicy… Other than that, again, absolutely delicious! What do I do with the left-over stock? I make 6-8 cups. Does it get absorbed as it cooks for 45 minutes? Great recipe can not wait to taste it. Just a follow-up to my comment #34. I did this dish for our New Orleans themed dinner club this past weekend and the response was amazing. We had 8 people in total so I increased the recipe amounts (not quite doubling everything). We cooked about 5-pounds of shrimp (31/40s) and increased anything with spice in it by about a third. We made sure to keep up the herb quotient, however, as this is where a lot of the great cooking smell and flavour comes from. Again, making a good shrimp stock base is the key to this dish and having enough so that you can best manage your time. When you have a dinner club where everyone is responsible for a course you don’t have the luxury of controling the time when people eat, so the base cooked longer with the help of extra stock and the shrimp went in for the last 7-minutes. Awesome dish, we will serve this again! Beautiful, Danno. Just beautiful. Thanks for sharing the culture, man. I have to say, the whole trick about making the shrimp stock separately was the DEAL. That’s it. Just in the same way, when making miso soup, you need to make the nihon dashi–the Japanese soup stock–in order for the dish to taste authentic. I need to check out more of your NOLA Cousine. Excellent! I made a medium chocolate roux before adding the trinity and needed about 3 cups stock to get the right consistency for me. My creole seasoning has no salt so added Tony Chachere’s to taste. The home made stock is the key. A beautiful recipe! What a spectacular recipe! My family loves it. I will definitely be making some of your others real soon. Thanks! Incredible flavor! The shrimp stock had the house smelling wonderfully fragrant! After cooking the roux, I added 2 tbl. of dry sherry to make a paste before adding the shrimp stock and it added another layer of flavor. I also cut back a little on the creole seasoning and the green onions, but that’s a personal preference. My Louisiana native friend raved about it! Can’t wait to try it with crabmeat! Can you please tell me how many-ish stems of thyme are in a bundle? Are we talking pinky finger thickness? Exactly 27 twigs? I don’t want to over-do the thyme. I made this tonight for Mardi Gras. It turned out as pretty as the pictures but way too salty. Could it be that the Creole Seasoning that I used had too much salt? If so, do you have a favorite? Thanks! I agree, making the homeade stock is key. Use what you’ve got and try to keep it close to the recipe as you can. How do you get 11 1/2 cups stock out of 6-8 cups of water? Liz–I always use Tony’s Lite….I don’t think the container says so, but it’s low in salt. I like it because you can add all the garlic/onion/pepper goodness of Tony’s without worrying that your dish will be too salty. I learned my lesson after deciding that all my veggies dishes required gobs of Tony’s and then being alarmed at how quickly the salt outpaced the rest of the spices. Came out great, although I used clam juice instead of shrimp broth. Will do the shrimp broth next time. That is a lot of ingredients. I need to get my mom’s recipe because I am desperately missing Creole food right now (Not that Turkish food is bad, lol). Great site and thanks for posting that mouth watering picture. I need to work with this a bit. Two tablespoons of Creole Seasoning made the dish too salty (and too hot for the wife). Also did not like cooking veges in butter then adding flour. Just a sticky mess, no way to judge color of roux. I will add flour first to butter, make roux then add veges. Wow! Made this last night for a dinner party of 7. Came out wonderful. Received rave reviews! I tripled everything in the recipe except the shrimp, only doubled the shrimp, but there was still plenty. Served with corn muffins and everyone had seconds, some even thirds! Excellent work! This is a keeper. I’ve been keeping shrimp shells for years, but the lemon juice idea is AWESOME….when buying cajun/creole seasoning, get one that doesn’t have “salt” as the first ingredient !!!!!! Wow, so my uncle makes good etouffee, and I’ve been craving it. So I milled around on the internet for a while trying to find a good recipe (as he won’t share his, it’s a secret), and I decided to try yours. Absolutely awesome, my roommates all thought so too! I made this dish tonight for dinner. I think it is hands down the best Etouffee I have every tasted! I think my wife fell in love with me all over again after eating it! Great recipe!!! My boyfriend and I just came back from New Orleans and had a craving for etouffee. I made this recipe and it was amazing. I will be making it again tonight. He will be quite happy. thanks for the recipe!! I thought this dish was really delicious. It was not too hot for me but some may want to cut the seasoning in half. No problems with salt as we make our own creole seasoning. I also made the shrimp broth and had no idea it was so easy.I added some extra broth as it cooked to keep it from getting too gummy.Served with salad and french bread for a great meal! This was soooo good that I’m cooking it for Thanksgiving instead of turkey!!! The recipe is right on. I am known for this recipe among my friends here in Austin! Whenever I make it (and I make giant pots- I can’t help but triple the recipe), people clear their schedules to come eat at my place! I found this recipe a couple of weeks ago and asked my wife to make it for my birthday. She’s usually a 4 ingredient cook, so this was above her usual skill level, however, it turned out perfectly. Generally, I need to add pepper of some sort to everything I eat. This had the perfect balance and I would change a thing. Thanks for posting this recipe, it brought back memories of being at the French Quarter Festival and eating this while listening to some great music. My son made this for his final project in Nutrition class. We are making it again at his request. Delicious! My husband enjoyed etouffee so much when we were in New Orleans and wanted me to try to make it … so…. this recipe was my first attempt. Turned out great! We had a small dinner party last weekend and I served this recipe (tripled). Everyone loved it and wanted the recipe, so I’m sharing. Delicious! Wonderful, wonderful dish!! I made it the first time for me and my husband, we loved it so much that I made it for a luncheon at work and I’ve made it for a couple parties. EVERYONE loved it and wanted the recipe. Some advice: just make sure you have plenty of time when making it…it does take me a couple hours but every bit worth it!! Thank you Nola!!!! This tastes wonderful! I love this!! I have been in search for the best Creole recipes for 10 years. I just found this website yesterday and decided to try this recipe. This is EXACTALLY the flavor I have been looking for!!! I am so impressed how simple yet flavorfull this recipe is. Thank you so much for putting this site together. My tastebuds were definitely singing last night. What a wonderful recipe – it’s a keeper.. This was incredible! (Even without the homemade Worcestershire…) Thank you for a great collection of recipes! I made this yesterday and did everything but the homemade Worcestershire. (Maybe next time…) Thank you for sharing such a wonderful recipe. This is fantasy food–I found myself reminiscing about it all day, anxious for the day to end so I could go home and do it again! I live in the Pacific Northwest and cajun/creole restaurants are just about impossible to find. Don’t get me wrong…Seattle has some of the most amazing eateries in the world. Most are small, off the beaten path joints with less than 5 tables and crappy service and they put out unbelievable cuisine. Just wanted to let you know that your website has been the best when I get the urge for a taste of New Orleans. Making Shrimp Etouffe tonight for some friends and family. I make it in a 100 year old cast iron dutch oven (that I am pretty sure has 100 years of seasoning) that was passed down to me from my great grandmother. Whenever I make this dish it blows the hair back on everyone that eats it! Thanks. I made this, along with the muffuletta recipe on this website (including olive salad and the bread), for a football party today. This is the absolute best shrimp etouffee I have ever had! Your instructions were very easy to follow and the shrimp stock is to die for! Thanks for making our party a success. Hint: I would really love to get my hands on a good crawfish pie recipe…? I just wanted to thank you so much for the recipe! I had this dish for the first time when I visited Lafayette, only made with crawfish. I live in South Georgia and it is difficult to get crawfish, or a decent cajun/creole dish. I used the etouffee to stuff bell pepper, I put my rice in first then added the etouffee and topped with cheese. It turned out wonderful. Thanks again for the recipe. Just made this, and it turned out absolutely delicious. My husband said he was craving Shrimp Etouffee, and I had no idea how to make it. The recipe wasn’t as complicated as I initially thought. Thanks for the delicious dinner! Never made etouffee before – came out great (even w/ chicken stock instead of yummy shrimp stock.) Bravo…. And used L&P instead of homemade W-sauce – still awesome – 20min… ye ha. Pingback: The Anti-Chicken Fingers Recipe – Shrimp Etouffee Recipe | Must. Have. Wine. | Must. Have. Wine. Thanks so much for the awesome recipe. I lived in SE LA for awhile and a neighbor used to have me over for the best home-cooked cajun food ever–including utterly inimitable shrimp and crawfish etouffes. It’s been years, and I couldn’t really replicate what she was doing…until now–thanks!! (followed this pretty much to a T).